Christmas is the season to remember and share God’s love, Olivet School of Art and Design is going to reach out to friends and neighbors in a special way through the Winter Art Show. 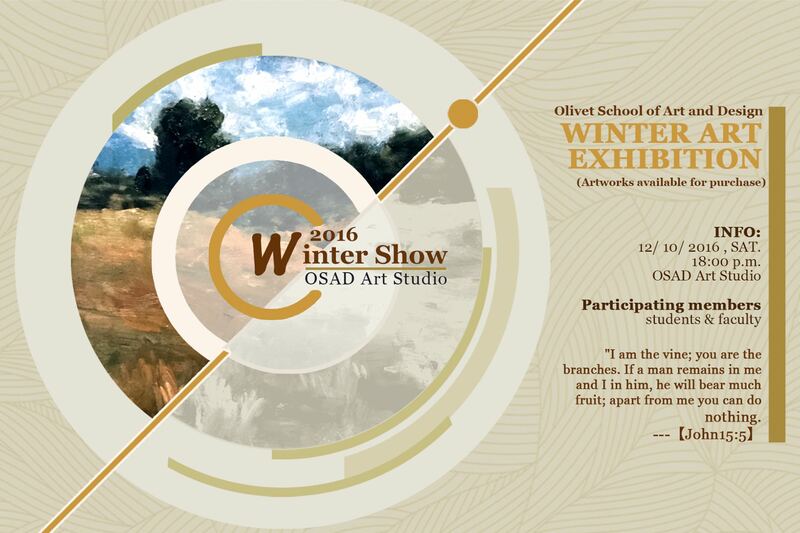 The OSAD Winter Art Show 2016 will be held on Saturday, December 10th from 6 to 9 pm at Riverside Campus Dining Hall, where students and faculty will present their 2D creations including photography, drawings, and paintings. Most of the artworks are fruits of the OSAD’s studio classes in this past year. Junior level students who had no previous experience in art are now able to develop their unique artworks with the skills acquired in these classes. They would like to share the grace and joy in creation with everyone in Riverside campus and the Anza community. “It is the Lord’s love and grace for us to learn and perform art. It is a blessing that we would like to share with our friends and neighbors. Art is like light showers in the desert, it brings life, it is refreshing and renewing,” said OSAD associate dean Zimou Tan. Artworks are available for purchase. Olivet University invites you all to join us this Saturday evening. Refreshment provided.